The dexos™ specifications have been developed by GM Powertrain engineers to meet the increasing demands placed on modern petrol engines. With improved viscometric properties, creating less friction in the engine which contributes to improved fuel economy and resisting aeration, which enables fuel-saving devices, such as Variable Valve Timing, to work optimally. Resisting degradation between oil changes, extending the time and mileage interval between oil changes while meets or exceeds API SM, ILSAC GF-4. dexos1™ in an innovation in engine oil. It was developed by GM for late model GM vehicles with petrol engines. It is also suitable for use in a wide variety of other makes and models. 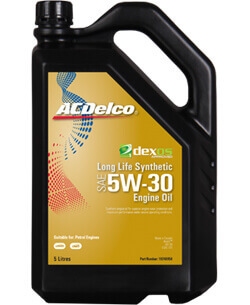 Additionally dexos1™ 5W-30 is a high performing engine oil, which keeps turbo chargers and intercoolers clean. All these properties in combination with the viscosity class SAE 5W-30 lead to significantly lower fuel consumption.